Milly Rich | Why do women take another name if they get married? 19 Oct Why do women take another name if they get married? I was married for 72 years, which seems an incredibly long time. From 1928 when women won the right to vote life changed for us in many ways. It used to be quite normal for people to ask women ‘is your husband in?’ and not to speak to the woman directly. As a woman you were not really perceived as an adult, you were treated more like a child or a possession. I really used to resent that, I didn’t want to be a possession, I always was and still am very much a person in my own right. 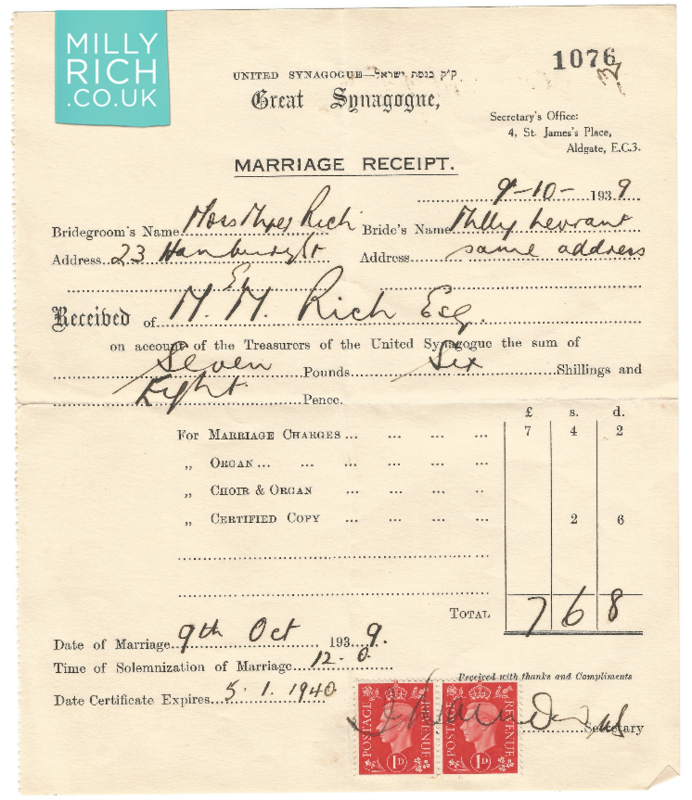 When marrying I thought you had to take your husband’s name, I didn’t realise it wasn’t obligatory, so I said to my husband to be ‘I’ll only take your name if you take mine!’ So we have a double name, Levrant-Rich. Having done that I’m at liberty not to use it but I’ve got it should I wish to. It doesn’t seem to me to be right to see yourself as someone’s possession, we were equal partners in our marriage. That said, the married couple is a social unit whereas the individual is not so marriage is a good thing if you look at in in that way. I’m in favour of marriage as it’s a public commitment, you’ve announced your union publicly. It is also nice to be promised things by a partner via the marriage ceremony, but then maybe that’s just me, I’m from another century after all! Speaking of names, I’m very fond of the bible stories and I adore the names from these stories. I love the name Delilah and Ruth is also a good one, quite hard but uncompromising. My daughter Shula – Shulamith, meaning Peace – was actually named Ruth Shulamith– Ruth Shulamith Levant-Rich, a good strong name with a real ring to it. My given name is Malka, Hebrew for Queen, which would explain a lot! I took on the name Millicent when I set up my Shell business as I felt the name was more businessy when printing my business cards.